The Campaign for UC Santa Cruz is entering its final months having surpassed its target of $300 million and focusing on building resources for unmet priorities all across campus. The campaign will draw to a close June 30. The campaign is the first campuswide effort to build a culture of giving in support of students, faculty, and campus programs. More than 57,000 donors—many of them alumni—have made gifts to the university since the campaign launch in 2009 and going public in the fall of 2013. John “Bud” and Rebecca Colligan have established the Colligan Presidential Chair in Pediatric Genomics with matching funds from the University of California Office of the President. The endowed chair will support a distinguished member of the UC Santa Cruz faculty whose research involves pediatric genomics. The UC Santa Cruz Genomics Institute is working to unlock genomic information to make possible targeted treatment of diseases, including a focus on pediatric cancer through its Treehouse Childhood Cancer Initiative. Construction is underway on restoration and expansion of the iconic Quarry Amphitheater in the heart of campus. The project is being funded with nearly $6.4 million in existing student fee reserves and more than $1.6 million in gifts from alumni, parents, faculty, staff, and others. The venue was closed in 2006 after falling into disrepair. Completion of the first phase of the project, which will allow it to be reopened for use as a gathering and event space, is projected for fall 2017. The San Francisco–based Koret Foundation is supporting a Student Success Initiative at UC Santa Cruz with a $1 million grant for the new Koret Undergraduate Research Scholarships. The grant will fund 50 stipends of $1,500 for students in any discipline. It will also provide program and mentoring support for student research projects. UC Santa Cruz is one of 12 Koret University Partners. Thank you to all who joined Giving Day 2017! Visit givingday.ucsc.edu for event news. 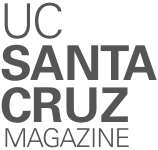 The Campaign for UC Santa Cruz is increasing private investment in the extraordinary education and research mission of UC Santa Cruz. These and all gift count toward the Campaign for UC Santa Cruz.